· Medivation, Inc. (MDVN): Q4 EPS of $0.03 beats by $0.11. · Revenue of $96.6M (+160.0% Y/Y) beats by $23.92M. · Western Gas Partners, L.P. (WES): Q4 EPS of $0.56 beats by $0.10. · Revenue of $290.62M (+36.5% Y/Y) beats by $17.82M. The February Kansas City Fed manufacturing index was reported at 4 versus expectations of 2. Revised fourth quarter 2013 GDP came in at +2.4% versus forecasts of +2.5%; the GDP price index was up 1.6% versus consensus of up 1.3%. The indices (DJIA 16272, S&P 1854) traded up yesterday. The Dow finished with its short ((15330-16601) and intermediate (14696-16601) term trading ranges. The S&P closed above the upper boundary of its short term trading range (1746-1848---I know I have been carrying this as 1858. Apparently, sometime in the past I transcribed the number and then subsequently didn’t catch my error). That starts the clock on our time and distance discipline which requires the S&P to remain above this level until the close next Wednesday. As you can see, even if the break is validated, it would leave the Averages out of sync on their short term trends---which would leave the Market in a no man’s land with respect to its short term trend. Intermediate term, the S&P is in an uptrend (1721-2501). Both of the Averages are above their 50 day moving averages and are in long term uptrends (5050-17400, 736-1910). Volume was flat; breadth improved. The VIX fell leaving it within a short term trading range and an intermediate term downtrend and below its 50 day moving average. Finally, I checked out our internal indicator at yesterday’s close. In a Universe of 155 stocks, 43 finished either at or above their all-time highs, 112 did not. Clearly this is not supportive of an upside breakout. The long Treasury moved up, staying within its short term trading range (indeed it is nearing the upper boundary of that range) and its intermediate term downtrend. GLD bounced back, finishing within a very short term uptrend but also a short and intermediate term downtrend. This puppy just doesn’t want to correct. Bottom line: the fourth time was a charm for the S&P---it closing above its all-time high. There are a number of caveats to this action: (1) volume was puny, (2) out internal indicator was hardly supportive, (3) if confirmed, this will leave the Averages out of sync---which leaves the Market trendless and (4) under our time and distance discipline, this challenge won’t be confirmed until next Wednesday [time] or the S&P advances to 1885 [distance] whichever comes first. Meanwhile, there is really not much to do save using any price strength that pushes one of our stocks into its Sell Half Range and to act accordingly. We finally got a data day that could be characterized as mixed (I can’t remember the last time that I was able to make that characterization): January durable orders were down less than anticipated, though December orders were revised lower; the February Kansas City manufacturing index came in better than expected; but weekly jobless claims were above estimates. I don’t want to get too jiggy about a single mixed day, but at least we finally have some positive datapoints. In other US news, Yellen testified before the senate yesterday, but little new came from it. Two minor points: (1) she did acknowledge that the economic data has been a bit weaker than expected but attributed much of it to the weather---hence, expect no near term action from the Fed stemming from the economy and (2) she gave no further guidance on the expected changes in forward guidance. Overseas, the Chinese yuan continued to push lower---a major negative for the carry trade---and the tension in Ukraine remained at a high pitch. On the latter point, I am not so much worried about what occurs internally or any spillover economic impact on the rest of the world (Ukraine is small, poor and its debt is not widely held) as I am about the risks of some kind of international showdown between the US and Russia. To be clear, I don’t think that there will be shots fired; no what worries me is that Obama and/or Kerry draws another line in the sand; and Putin just doesn’t push back but creates a crisis from which Obama/Kerry have no choice but to back down and the US loses face big time. I don’t think that would be good for investor morale. Bottom line: the S&P unquestionably took out its old high, although not dramatically so. On the one hand, there were a number of non-supportive technical factors which I listed above. On the other hand, the advance was in the face of rising tensions around Ukraine and Yellen sticking with tapering. So at the moment, I have every reason to believe that the current challenge has as strong a likelihood of being confirmed as any other. The one thing that has to happen is that breadth has to catch up to price; but again there is no reason at the moment to assume that it won’t. If the Averages do take out their highs, then the next target is the upper boundaries of their long term uptrends. However, those levels are so close that I don’t see a lot of reward for spending cash reserves; and when I compare it to the downside risk due to significant overvaluation, there is no incentive for me to get off the sidelines. It is a cautionary note not to chase a rally if it occurs. 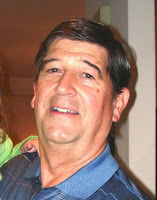 Steve Cook received his education in investments from Harvard, where he earned an MBA, New York University, where he did post graduate work in economics and financial analysis and the CFA Institute, where he earned the Chartered Financial Analysts designation in 1973. His 40 years of investment experience includes institutional portfolio management at Scudder, Stevens and Clark and Bear Stearns. Steve's goal at Investing For Survival is to help other investors build wealth and benefit from the investing lessons he learned the hard way. (4) an ongoing share repurchase program. (2) the company is unionized and therefore subject to strikes, work stoppages, etc. (3) it is subject to the volatility in currency and fuel prices. The company is rated A by Value Line, has a debt/equity ratio of approximately 34% and its stock yields 1.5%. Note: CNI stock made great progress off its March 2009 low, quickly surpassing the downtrend off its May 2008 high (straight red line) and the November 2008 trading high (green line). 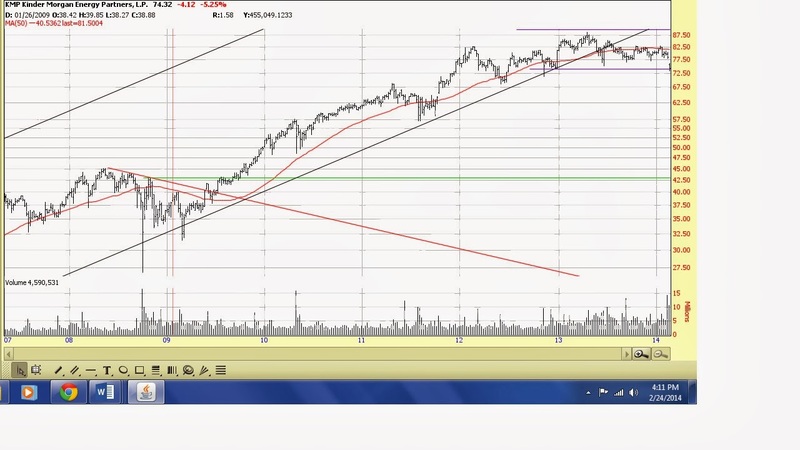 Long term, the stock is in an uptrend (blue lines). 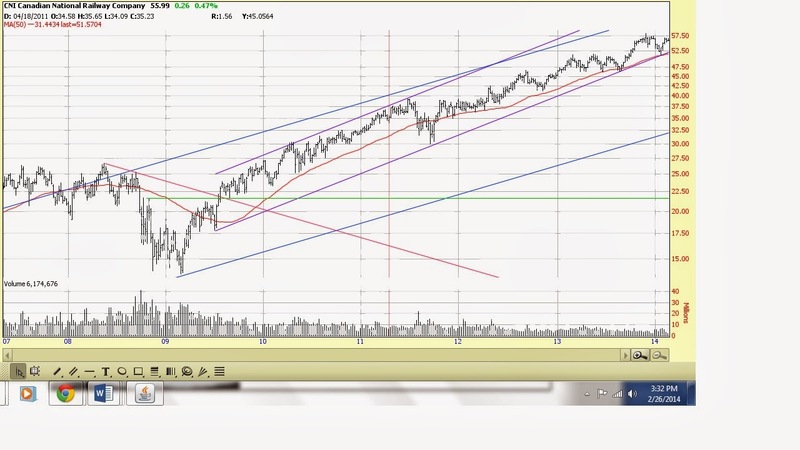 Intermediate term, it is in an uptrend (purple lines). The wiggly red line is the 50 day moving average. The Dividend Growth Portfolio owns a 75% position in CNI---having Sold Half in mid-2011 and benefitted from subsequent higher prices. The upper boundary of its Buy Value Range is $31; the lower boundary of its Sell Half Range is $62. Weekly jobless claims rose 14,000 versus estimates of a 1,000 decline. January durable goods orders fell 1.0% versus forecasts of -1.6%; however, the December reading was revised down from -4.3% to -5.3%. Yesterday the indices (DJIA 16198, S&P 1845) were quiet and fractionally up, closing within their short term trading ranges (15330-16601, 1746-1858), though the S&P challenged its upper boundary for the third day in a row and failed. The Dow closed within its intermediate term trading range (14696-16601) and closed above its 50 day moving average, while the S&P is in an intermediate term uptrend (1721-2501) and above its 50 day moving average. Both are in long term uptrends (5050-17400, 736-1910). Volume was flat; breadth recovered slightly. The VIX was up 5%---a little unusual for a slow day. It finished within its short term trading range and its intermediate term downtrend. The long Treasury rose, staying within a short term trading range and an intermediate term downtrend. With this positive close, the head and shoulders formation has been negated. GLD fell noticeably---one of the few times in the current very short term uptrend. Perhaps this is the beginning of a test of this trend; something that I have been waiting for. It remains in a short and intermediate term downtrend and above its 50 day moving average. Bottom line: the S&P made a third challenge on its all-time high in as many days and failed again. Nevertheless, the subsequent sell off was not indicative of major failure; indeed, given the magnitude of the Markets overbought condition, it is surprising that prices haven’t backed off more than they have. In short, the bulls are alive and well. So I remain on watch. If the past three days are a prelude to a more furious/successful assault on 1858, then the next stop is likely the upper boundaries of the Averages long term uptrends. If they are forming a triple top, then the lower boundary of the S&P’s intermediate term uptrend becomes the focus. Meanwhile, we have a Market in a trading range; so there is really not much to do save using any price strength that pushes one of our stocks into its Sell Half Range and to act accordingly. We got two housing related indicators yesterday: weekly mortgage and purchase applications were down while January new home sales were surprisingly strong. Bear in mind that for seasonal reasons January is not a good month to judge the housing market and that new home sales are roughly one tenth of existing home sales. However, good news is still good news whatever its form; so I don’t want to discount this number too much. Overseas, there was a single data point worth reporting---French unemployment hit an all-time high. In politics, (1) the risk of additional violence in Ukraine is growing and (2) in the US, the house is working on a tax reform bill which has already been declared DOA by much of the ruling class and the media. Bottom line: I am not sure what to make of investor response to yesterday’s news flow. The biggest item was the very positive January new home sales. Initially, stocks rallied, suggesting that the goldilocks scenario was in play (i.e. the perfect outcome, balancing economic progress, the impact of weather and Fed policy). However, the uptrend didn’t last long and, most important, the S&P couldn’t hold above its all-time high which at least raises questions about the depth of confidence in the goldilocks scenario. On the other hand, as I said above, the Market is extremely overbought, so some backing and filling should be expected. In addition, Yellen is testifying before the senate today and investors may have wanted to be cautious ahead of that event. All that said, equity valuations are near historic highs on numerous measures irrespective of even the most favorable outcome of economic growth, the impact of weather and Fed policy. 3. Synch your time horizon with your risk profile. It’s critical to know why you’re entering a trade and equally important to understand how long you intend to hold the risk. While these are often mutually exclusive thoughts, they are interdependent when it comes to the execution of your strategy. 4. Play within your zone. · Expeditors International of Washington, Inc. (EXPD): EPS of $0.41 misses by $0.06. · Revenue of $1.63B (+6.5% Y/Y) beats by $50M. The International Council of Shopping Centers reported weekly sales of major retailers down 0.6% versus the prior week but up 1.4% on a year over year basis; Redbook Research reported month to date retail chain store sales up 2.9% versus the comparable period a month ago and up 2.9% versus the similar timeframe last year. The November Case Shiller home price index rose 0.8% versus expectations of up 0.6%. February consumer confidence came in at 78.1 versus estimates of 80.1. The February Richmond Fed manufacturing index was down 6 versus forecasts of up 3. Weekly mortgage applications dropped 8.5% while purchase applications declined 4.0%. The indices (DJIA 16179, S&P 1845) had a dull day remaining within their short term trading ranges (15330-16601, 1746-1858), though the S&P challenged its upper boundary for the second day in a row and failed The Dow closed within its intermediate term trading range (14696-16601) and closed above its 50 day moving average, while the S&P is in an intermediate term uptrend (1719-2499) and above its 50 day moving average. Both are in long term uptrends (5050-17400, 736-1910). Volume was off considerably; breadth deteriorated. The VIX fell, somewhat surprisingly for a down price day. It closed within its short term trading range and intermediate term downtrend and below its 50 day moving average. The long Treasury rose, leaving it within a short term trading range and an intermediate term downtrend. Its move up was sufficient that a close at current levels today will invalidate the head and shoulders formation. GLD increased again, finishing within a very short term uptrend but also in a short and intermediate term downtrend. Unfortunately, I am still waiting for a correction before considering nibbling again. Bottom line: the S&P made a second challenge on its all-time high in as many days and failed again; though yesterday’s volume much less impressive than Monday’s. On the other hand, the news continues bleak---so a two point decline on the S&P should be viewed as a moral victory for the bulls. I don’t think that the pin action gave us any hint on the odds of a successful challenge on the Averages all-time highs. So I remain on watch. If the past two days are a prelude to a more furious/successful assault on 1858, then the next stop is likely the upper boundaries of the Averages long term uptrends. If they are forming a triple top, then the lower boundary of the S&P’s intermediate term uptrend becomes the focus. The US economic news remains concerning: weekly retail sales were mixed, February consumer confidence was below expectations and the Richmond Fed’s February manufacturing index was negative. There was one positive report---the November Case Shiller home price index rose 0.8%---the operative word being ‘November’. Overseas, Chinese corporate debt hit record highs while Ukraine is suffering a run on its banking system---neither apt to brighten the global economic outlook. Bottom line: there is nothing inspiring by the economic data flow save that (1) its disappointing nature lifts investors’ hopes that the Fed will keep the monetary spigots open for as far as the eye can see. That may occur although that is not what the Fed stated clearly in its last FOMC minutes, or (2) it can be totally discounted as weather related which may be the case. But that is a risky bet, in my opinion. Equity valuations are near historic highs on numerous measures. They can, of course, become more overvalued. Indeed, that is exactly what has occurred over the last year. However, like Russian roulette, that is a game I can choose not to play. (4) an active acquisition program [latest---Tennessee Gas Pipeline, El Paso Natural Gas]. (2) it huge capital expenditure budget could impact the growth of distributions. KMP stock made great initial progress off its March 2003 low, quickly surpassing the downtrend off its May 2008 high (straight red line) and the November 2008 trading high (green line). KMP stock broke below its long term uptrend in early 2013 and also traded below the lower boundary of its Buy Value Range. In the latter case, it was Removed from the High Yield Portfolio’s Buy List. It is currently trading in an intermediate term trading range, though the stock got whacked hard yesterday as a result of a negative article in Barron’s. The critical price at the moment is the Stop Loss Price which is $70. As long as KMP remains above this level, the High Yield Portfolio will continue to Hold it. A trade below that level will result in the elimination of this position. o HollyFrontier (HFC): Q4 EPS of $0.31 beats by $0.11. o Revenue of $4.83B (-6.2% Y/Y) beats by $1.1B. o Home Depot (HD): Q4 EPS of $0.73 beats by $0.02. o Revenue of $17.7B misses by $0.22B. · EOG Resources (EOG): Q4 EPS of $2.00 beats by $0.06. · Revenue of $3.75B beats by $0.12B. · Oneok Partners, L.P. (OKS): Q4 EPS of $0.67 beats by $0.01. The February Dallas Fed manufacturing index came in at 0.3 versus estimates of 2.5. The Morning Call--A pause that refreshes? The Morning Call---A dead cat bounce?